One of the stars of CBC's "This Hour Has 22 Minutes" has pledged to donate $1 for every tweet lobbed at Paul Calandra — as long as it refers to the Conservative candidate as a "tool." Mark Critch tweeted Wednesday that he would give up to $1,500 to Planned Parenthood in St. John's. It all began when the Mike Duffy trial reignited with the testimony of Nigel Wright, the former chief of staff to Conservative Leader Stephen Harper. After the court adjourned for the day, CBC News journalist Rosemary Barton led a panel with Calandra, NDP candidate Charlie Angus and Liberal candidate Dominic LeBlanc. 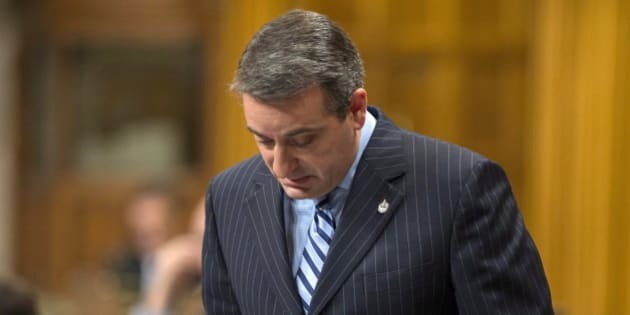 Critch tweeted that Barton had done a great job "keeping Paul Calandra honest" and called him a "a slippery tool." After that, Calandra — a former parliamentary secretary to Harper — apparently blocked him on Twitter. The Tory candidate was "clearly running scared," Critch said. "I don't even think of it as a political thing,'' Critch said Friday of the Twitter campaign. "It's just hey, look, you can't block thought, you can't just say 'Anybody who criticizes me, I want them blocked out,' because you're there to represent people,'' he told The Canadian Press. Critch says the campaign has "taken on a life of its own,'' and he doesn't want to waste time counting the tweets, and so he'll simply donate $1,500 to the Newfoundland chapter of Planned Parenthood. But the campaign drew criticism from former Sun News commentator Ezra Levant, who accused the comedian of breaking the CBC's employee code of conduct by engaging in partisan behaviour. "CBC comedian joins the election campaign. His partisan war-chest filled by taxpayers," Levant tweeted, setting off a flurry of messages between the two. Check out the Twitter skirmish between the two, compiled by regular Power & Politics pundit Ian Capstick. Critch stated he is a freelancer, not a CBC employee, and the code of conduct refers to on-air news personalities. "I'm a clown, I'm not Peter Mansbridge," he said. "On the TV show, I walk up to and insult politicians."